In Tron (1982), Kevin Flynn’s (Jeff Bridges) video game creations were stolen by his former co-worker, Dillinger (David Warner). In order to prove that his games were stolen, Flynn tries to hack into the mainframe of his former workplace, ENDCOM with no success so decides to go to the business himself in order to find proof of the larceny. While there, the Master Control Program (MCP — voiced by David Warner), which has become self-aware, digitizes Flynn and downloads him into the mainframe. In the mainframe, Flynn is forced to fight other programs that appear in the image of their creators and they really can die. Can Flynn get out alive?I was never interested in watching Tron. My mother, a huge fan of a specific sci-fi I don’t usually like, was scrolling through movies while visiting and intrigued by the plot. In our house, whatever Barbara wants to watch, we all watch (she’s doesn’t television, which keen readers of this blog will know her religion prohibits, if we’re all in the room … let’s forget that she chose the movie) and that’s the story of how this 46-year-old woman finally saw Tron which was released in theaters when I was 11. Let me first get out of the way that in 1982, actor Jeff Bridges was pretty hot. His acting has developed over time. There were moments (and still are in movies) that I think he over pronounces his dialogue. The words don’t fall naturally from his lips as those in normal conversation might. It makes for what I’d call a bit of a wooden performance. I suppose this is what makes him so great as “The Dude” in the Big Lebowski as he’s always sounded somewhat high (observation not declaration). What was great about Tron is that it takes us into an (at the time) emerging technology and makes it something truly terrifying. MCP, a technology-based system, has some serious plans that are on the level of world dominance. That it has the ability to digitize humans is terrifying on its own but its level of independent thinking and calculating ambition does not bode well for the future world. The movie, based on a story by Stephen Lisberger and Bonnie MacBird is part cautionary tale on the advance of the machines. For those who remember, in 1982 the state-of-the-art home computer was the Commodore 64. I don’t know about you, but I spent many a happy hour inputting hundred of lines of code to struggle reading back through the lines to find the error that kept my dancing stick figure from appearing. The idea that where Tron takes the viewer is where we could go and it is staggering even now. The story was solid and there were some breathtaking moments. Tron was initially supposed to be made as an animated film but the visual impact would not have been as striking. The set designer was French cartoonist, Moebius, perhaps best known for the Blueberry series and highly esteemed by contemporaries from surrealists to Stan Lee. The futuristic inner computer setting is minimalist featuring neon, trendy in its day and still conveying an arcade theme to viewers today. 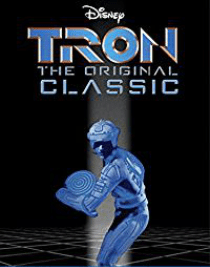 Tron was the first in what ultimately became a trilogy with Tron Legacy released in 2005. If you like sci-fi, like me and haven’t seen this film, give it a shot. If nothing else, leering at young Jeff Bridges for 96 minutes is quality entertainment.